Do we have a snob on our hands? Quite possibly. And what does “too leggy” mean anyway? This hints of the type of drinker who spouts more and knows less. And that typically bugs the person who knows what they like but isn’t certified-this or certified-that. Myth #1: The wider the “legs,” the better the wine. Fact is, wines exhibiting prominent “legs” don’t necessarily taste better. Myth #2: Old wines are better than young wines. (Corollary: Old wines are worth a lot of money.) Only a fraction of the world’s wines will increase in complexity and value as they age. To be on the safe side, wine should be drunk within a year or two of harvest. In the U.S., most wines are consumed within 24 hours of purchase. Myth #3: Expensive wines are better. A $100 price tag on a bottle of wine is no guarantee of quality. Plenty of good (maybe not great) wines can be found in the $15-$30 price range. Myth #4: Wine should be allowed to “breathe” before consumption. Decanting is probably the best idea if a wine truly needs to “breathe.” Aggressive young wines can “open up” with additional aeration. Older wines need to be decanted for a different reason—to separate the wine from sediment that may have accumulated in the bottle. Myth #5: White wine can be refrigerated indefinitely. No wine can be stored indefinitely, even under ideal conditions. White wines can and should be refrigerated before serving, but not necessarily stored in the refrigerator, where the temperature is around 40 degrees. The dehumidifying conditions can cause corks to dry out and shrink, thus compromising the quality of the wine. To be on the safe side, store wines at a consistent temperature and refrigerate before serving. Myth #6: Wines can be made without sulfites. No wines are sulfite free. Sulfites occur naturally in grape skins, and sulfur is used as an antibacterial in the winemaking process. Even wine labeled as “organic” contains some level of sulfur. Myth #7: The “best” wines come from France, Italy, and California. 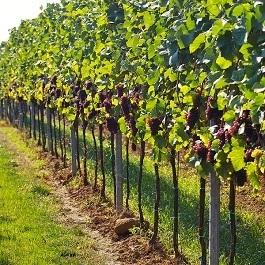 “Good” wine is a product of careful viticulture and competent winemaking. Great wines can come from places you might not expect, like Canada or Pennsylvania. Remember, California was not known or respected as a wine region as recently as the 1970s. 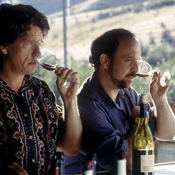 Now Napa and Sonoma wines are regarded as some of the finest in the world.